It seems that everywhere we go these days, we are finding more and more pet friendly rail trails to explore with our dogs. 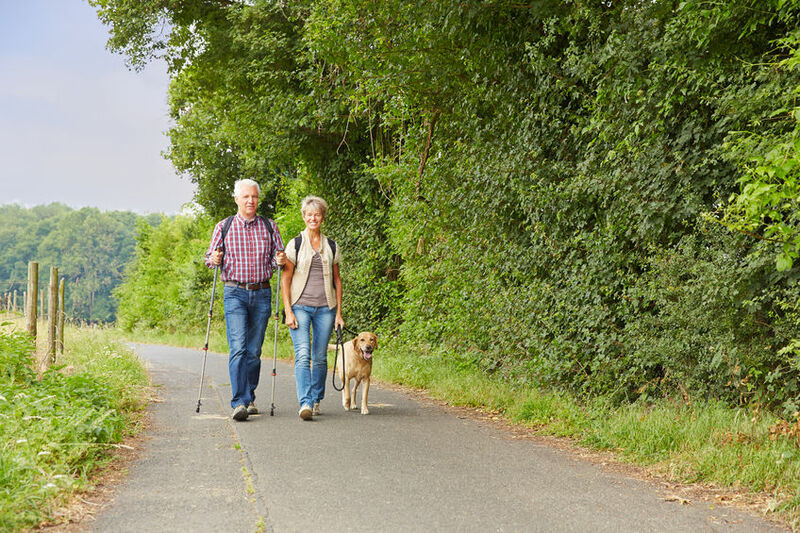 Rail trails (which are public paths made from former railroad corridors) are great because you get to exercise with your pet while walking or riding a bike through beautiful natural scenery and/or historic towns. And because railroads once crisscrossed all areas of the country in the 19th and early 20th centuries, they are ubiquitous, and more and more of them are being transitioned to pet friendly rail trails, used by millions of Americans each year. There are currently more than 2,000 trails in the U.S., with at least one in every state. One of our favorite supporters of rail trails is Rails to Trails Conservancy. A nonprofit organization started in 1986, they do the hard work of supporting and promoting thousands of miles of rail trails from coast to coast. Their efforts involve advocacy on the federal, state and local levels, research expertise, and on-the-ground development of trails. They also fund groups that develop and/or maintain and improve the trails. Since 2015, through their Doppelt Family Trail Development Fund Grant Program, the RTC has awarded close to a half-million dollars in grants. This year’s grantees included Marin County Bicycle Coalition in California, the Friends of Clare County Parks & Recreation in Michigan, and the New Jersey Bike & Walk Coalition, among many others. Just as the railroads once connected towns and cities, rail trails have relinked these communities, crossing open fields, winding through mountainous terrain, and hugging riverbanks, allowing people and their pets to rediscover these quaint and beautiful vistas. One of our favorites is the Hudson Valley Rail Trail, which passes very close to the Petswelcome offices and crosses over the Hudson River to continue in Ulster County, New York. Most likely you won’t have to go very far to find one either. Just check out the Conservancy’s Trail Finder by putting in your zip code and you’ll be ready to hit the trail with your pooch in no time. And, of course, we highly recommend you take advantage of the pet-friendly rail trails when you’re on a trip. Some great ones are the Napa Valley Vine Trail, which intersects with many dog parks and is close to, of course, Napa Valley pet-friendly wineries. Another great trail is the Cape Cod Rail Trail, which also takes you near many Cape Cod pet-friendly parks and beaches, including the Pilgrim Bark Park and the Cape Cod National Seashore. And for a more sylvan experience, you can walk or pedal through the green forests of Oregon on the Banks-Veronia State Trail. Halfway through this 22-mile trail, you cross pet-friendly L.L. Stub Stewart State Park whose 1,800 acres offers camping, hiking and horse riding. And, of course, if you need to find a pet friendly hotel, Petswelcome is here to help you. When taking your dog on a rail trail, there are a few simple rules you need to follow. First, make sure she is comfortable around strangers, other animals, and bike riders because you will encounter many on these trails. Also, always use a short leash so you can better keep them under control and have plenty of water to keep you both hydrated. Finally, of course, make sure you have a scooper for clean-up, if necessary. Whether you think you need to or not, we highly recommend that you get your life back on track (get it?). You’ll be glad you did. 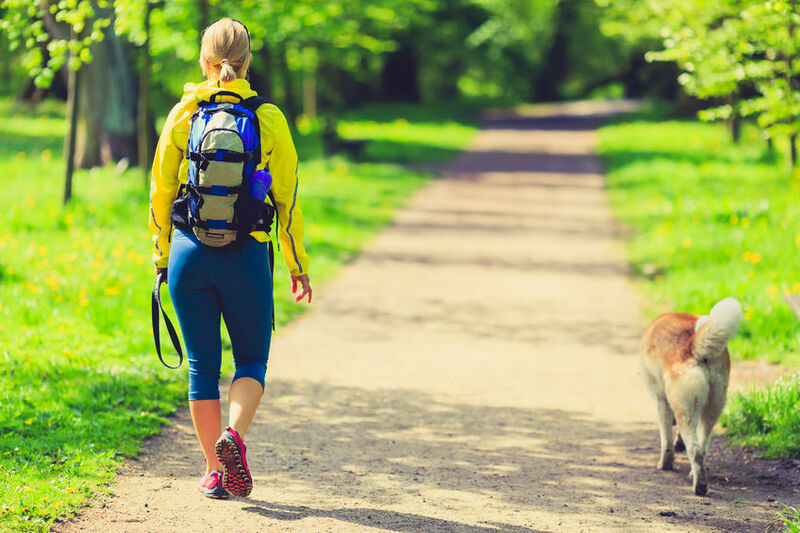 From forests to beaches, urban centers to rural settings, pet friendly rail trails are a wonderful way to explore the roads less traveled with your favorite animal in tow.